MasterPieces: The Call of Cthulhu | Warped Factor - Words in the Key of Geek. "There was always one who was fascinated by that terrible book." So said the Second Doctor of the Master in The Nameless City, the second Puffin eshort released to celebrate the 50th anniversary of Doctor Who. 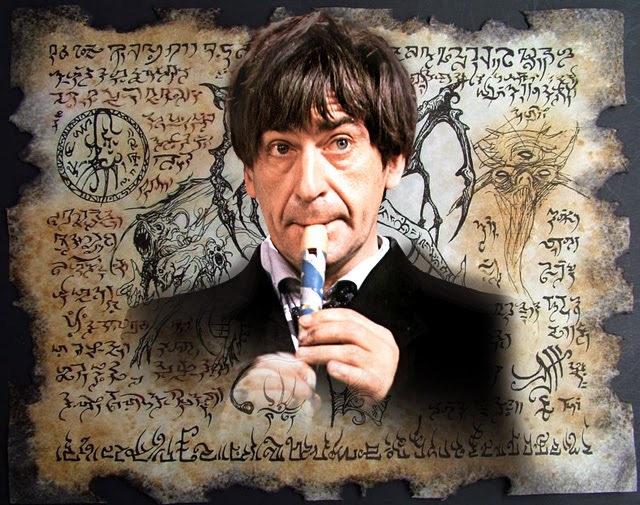 The quote refers to the Necronomicon, and it is implied, at least retrospectively, to be the Doctor's first encounter with the blackened tome - its dark power allowing it to take control of the TARDIS & send the Second Doctor & Jamie to face retribution at the hands of the Archons, here added into the varied pantheon of Great Old Ones, following a journey through the Great Devastation. "When I drew nigh the nameless city I knew it was accursed. I was travelling in a parched and terrible valley under the moon, and afar I saw it protruding uncannily above the sands as parts of a corpse may protrude from an ill-made grave. Fear spoke from the age-worn stones of this hoary survivor of the deluge, this great-grandmother of the eldest pyramid; and a viewless aura repelled me and bade me retreat from antique and sinister secrets that no man should see, and no man else had ever dared to see. I should have known that the Arabs had good reason for shunning the nameless city, the city told of in strange tales but seen by no living man, yet I defied them and went into the untrodden waste with my camel. I alone have seen it, and that is why no other face bears such hideous lines of fear as mine; why no other man shivers so horribly when the night-wind rattles the windows." During this particular plan of his the Master uses the alias of Professor Thascalos, just as he later would in The Time Monster while looking to harness the power of Kronos, the Chronovore. 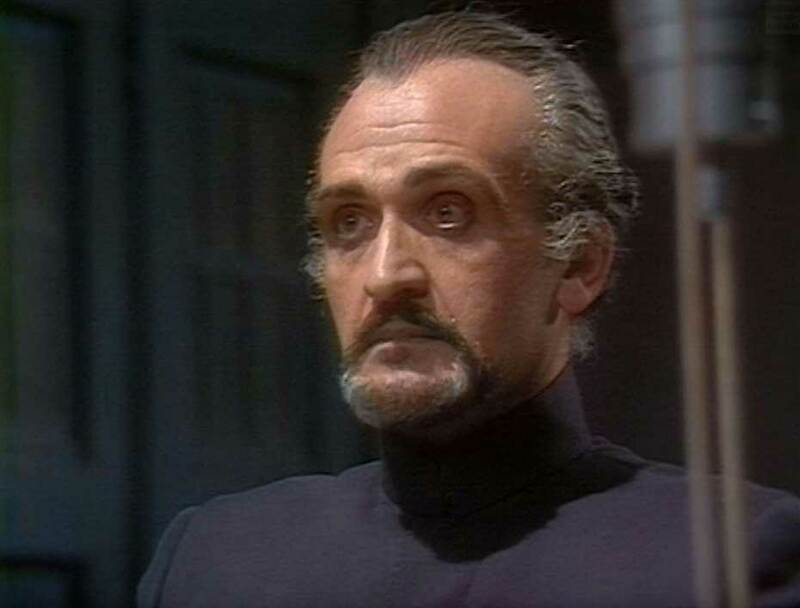 The book he so covets is implied to be older than most universes & even the Time Lords themselves, & by the time of The Quantum Archangel he will possess a copy in his TARDIS library. It has a chequered history! Of this desert many strange and unbelievable marvels are told by those who pretend to have penetrated it. In his last years Alhazred dwelt in Damascus, where the Necronomicon (Al Azif) was written, and of his final death or disappearance (738 A.D.) many terrible and conflicting things are told. He is said by Ebn Khallikan (12th cent. biographer) to have been seized by an invisible monster in broad daylight and devoured horribly before a large number of fright-frozen witnesses. Of his madness many things are told. He claimed to have seen fabulous Irem, or City of Pillars, and to have found beneath the ruins of a certain nameless desert town the shocking annals and secrets of a race older than mankind. He was only an indifferent Moslem, worshipping unknown entities whom he called Yog-Sothoth and Cthulhu." 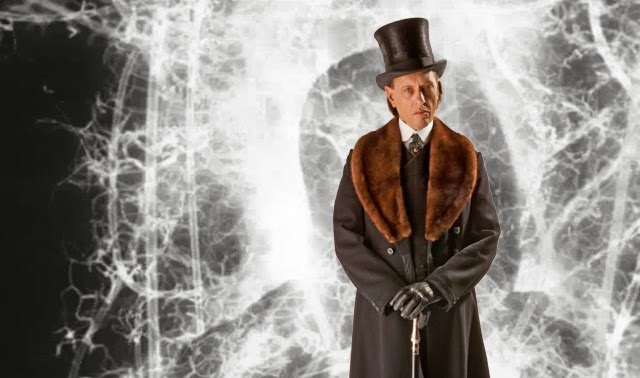 We, of course, know Yog-Sothoth by another name, this universe subject to a first visit from the Great Intelligence in The Snowmen as the Eleventh Doctor accidentally gives it the idea to use the London Underground, which it will by the time of their meeting in The Web Of Fear. Having lost its corporeal form fleeing the Fendahl, it would emerge at the Det-Sen Monastery of Tibet having possessed Padmasambhava during one of his trips along the astral plane. "Take this pyramid I have prepared. Take it to the caves. Then the Great Intelligence will focus upon this planet. Soon it will begin to grow and at last take on physical form. At last its wanderings in space will be at an end. My work will then be done." Intriguingly enough during the events of the story its the lama who's called Master! DOCTOR: Yes, but the control units, they were made somehow, somewhere? SONGTEN: The Master laboured for nearly two hundred years. With the help of the Intelligence, he built the creatures and the other wonderful machines. Though it's an altogether knowingly more evil one by that name who will attempt to use the power of the Necronomicon in The Nameless City. Author Michael Scott was able to incorporate elements of the Cthulhu Mythos thanks to the ''shared universe'' concept, which allows authors to borrow elements of HP Lovecraft's own work & insert them into their own. Scott has the Necronomicon presented to Jamie McCrimmon by the Master, posing as the elderly bookseller Professor Thascalos in London of 1968. The piper's helped "Thascalos" out of an attack by a thief, actually staged to draw Jamie to him! And while he refuses an offer of payment for his bravery, the man he's just saved insists on giving him a gift. While the young Scot can't read the book himself, he's encouraged to pass it on to someone he thinks might appreciate it. You can probably guess who that might be! The Doctor doesn't initially recognise the Necronomicon, although he'll soon know its power. His inspection of the cover & contents of possibly the most evil book in the known universe will give way to pure terror! "Interesting. What is that? Looks like a type of cephalopod." There's some confusion over the writing within, too. "This looks like Sumerian, but this here is certainly one of the Vedic scripts, while this is Rongorongo from Easter Island. No, no, I'm wrong. This is older, much, much older..."
"To our doom, Jamie. To our doom"
...might be bang on the money. Until the Music of the Spheres is disturbed, in any case. Drowning out its harmonies with the amplified rasp of his recorder & Jamie's bagpipes the Doctor & his Highlander friend are able to escape their confinement.